Ribery: "Our game's even harder to second guess"
Munich - For the past six years, has been lacing up his boots for the FC Bayern Munich cause. The 30-year-old French midfielder happily admits to feeling "completely at home" in the Bavarian capital, not least because he's "part of an exceptionally strong team and the fans love me." In an interview with bundesliga.com, Ribery reflects on Bayern's treble-winning campaign talks about new head coach Pep Guardiola, and casts an eye forward to the season ahead. bundesliga.com: Franck Ribery, do you still often think about last season's historic treble? Franck Ribery: For sure. It was an unforgettable experience. I woke up happy every day on holiday, just thinking back to our UEFA Champions League triumph. We deserved to win all three titles. bundesliga.com: Looking back, what would you say was the key to that success? Ribery: The greatest achievement, in my eyes, was that we were able to respond immediately to the dramatic home [Champions League] final loss to Chelsea in May 2012. Not many teams would have managed that. We showed incredible mental strength and never at any point gave up, or caved in. Quite the opposite, in fact. bundesliga.com: Having won everything last season, is it harder to keep the motivation level high this time around? Ribery: Not at all. For starters, the holidays were just the job to recharge the batteries. We're well aware that every team we play are going to be even keener to get one over on us - because what feels better than to beat the treble winners? But we're still very hungry ourselves and we want to have another successful season. bundesliga.com: You now have a new head coach in Pep Guardiola. What's your impression of how things are going after his first month in the job? Ribery: It's all been very positive so far. He's still trying things out, particularly on the tactical front, but I enjoy the training, because we're nearly always working with the ball. Every drill needs your total concentration. A lot of it's concerned with tactical details and we need a bit of time yet to find the right balance, but I'm sure we'll soon have it. You can see how engaged and focused the coach is. He doesn't want to leave anything to chance and he's determined to consolidate the great results we had last season. bundesliga.com: FC Bayern enjoyed great success using a 4-2-3-1 system under Jupp Heynckes. Was it necessary to switch to 4-1-4-1? Ribery: Last season we won everything and if we didn't make any changes, our opponents would be more able to adapt to us. The new system makes our game even harder to second-guess. We can change tactics mid-match or switch a few players around to give the opposition even more trouble. bundesliga.com: What targets have you set for the coming campaign? Ribery: First-off we want to win the Bundesliga again. That's our priority, to show again who's top dog in Germany. Furthermore we want to go as far as possible in the Champions League again. It's going to be tough, because there are a lot of other really ambitious teams who've strengthened their ranks well, but we've certainly got the potential to go a very long way again. bundesliga.com: Over the summer you signed a new contract through to June 2017. Does that indicate that you'd like to end your playing days in Munich? 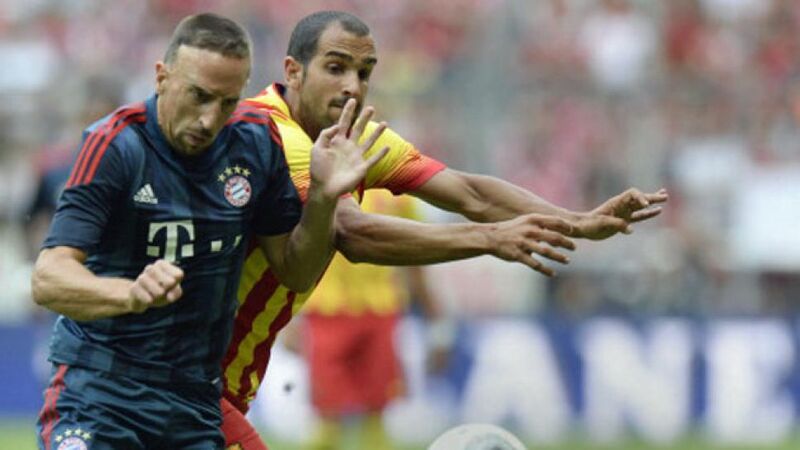 Ribery: Hang on, I only turned 30 in April, I've got a few years left in me yet. But if things continue as they have for the past three years, I'd certainly have nothing against it. I feel completely at home here and so do my family. I'm part of an exceptionally strong team and the fans love me. I find the football incredibly rewarding because we have such a spectacular, attacking style. What more can you ask for?